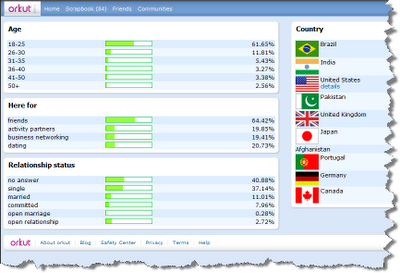 Orkut Demographics page displays all the statistics related to orkut. This page is viewable to all orkut members. This page displays stats about the age group of orkut members, their interests and what they want to do on orkut. The page also lays emphasis on the traffic sources and meantime it looks as if Brazil Dominate Orkut followed by Indians. Note: You Should be Logged into Orkut to see the Statistics.